If you have been wondering why there were rumors about the Galaxy S6 or HTC One M9 swirling for the timeframe of the MWC expo in two weeks, but nothing about LG's next flagship, wonder no more. Apparently, the LG G4 will see the light of day officially in April, which is still good, given that the G3 was revealed on May 28th last year. "LG Electronics decided not to release the G4 at the Mobile World Congress (MWC) exhibition in Barcelona in March,"a Korean publication has been tipped. "It may release it in April." Another LG source explains the reasoning behind that timeframe: "Samsung usually releases its new flagship model in the first quarter of each year, and Apple in the second quarter. We need some in-between time to make a bigger splash." Previously, we had an LG exec explain at the quarterly results press conference that "We rolled out the G3 in May last year so we do not plan to unveil the G4 at this year's Mobile World Congress and [will] spend more time perfecting the new phone." When we add all these, it seems indeed plausible that LG won't be waiting for a full year between the announcements of its flagships, and yet it won't pop out at MWC, either, which leaves the end of April as a good compromise. In the meantime, check out these great concept renders of the phone below, that are based on the leaked specs and design clues so far. Cant wait for the G4, Hope its something awesome as LG has been making some good phones the last few years. Will it beat the orangey looking photos of the S6 though? Not so sure about this. I mean with these specs, the only upgrade would have been the processor.? I'm sure LG will have a better camera probably a 20mp sensor camera and a low aperture lens like samsung. I want better build materials while still having a micro SD slot. Not so worried about having a replaceable battery, also wouldn't mind an improved battery life. Battery life wasn't a strong suite for the G3, UI was actually pretty good on the G3 but there's always room for improvement and a better screen would also help, the G3 screen has nice details but colors seemed a bit washed out. Really wouldn't mind if the screen size shrunk just a tad also, 5.5 to me was really threading a fine line between being a big screen phone or a small phablet. Better UI/Less laggy, Better OIS, 16/20MP, SD 810 or Odin, Better build quality, Perhaps 5.3/5.2", better design on the front, Waterproofing, Less heat, brighter display, Better battery and/or better optimization. Will be better than how my G2 was back in 2013. I really hope they don't make the same mistake they did with the G3. That monsterous screen cannot just have a 3000 mAh battery. Also knowing LG, if they're not gonna push on the screen front, they'll probably go for some other shock value. Something lke stated above, a 16 mp camera or better, or maybe 4gbs of ram. I reeeally hope they don't go crazy and put a 4k panel on there. i sold my g3 after a month ,because it was to laggy. I hope the G4 will not be similar to the G3 in terms of colors. I mean all the colors are black in the front. I just hate that. It's gonna be hard to top S6. No real testing from the S6 yet, but from what is known so far Samsung really has a winner on thier hands. If the S6 can deliver on what the performance rumors are and still have at least a S5 battery performance then Samsung's Galaxy S6 is going to be the phone that other phones are going to be measured on this year. I hope it's as revolutionary as the G2 was . unlike the G3 which was a step back and many devices were riddled with problems , poor battery, low light and visibility screen , heat issues and lag . i loved the G2 . This looks amazing. But after the whole HTC One M9 Revolutionary fiasco, I shan't let my heart be captured by renders. 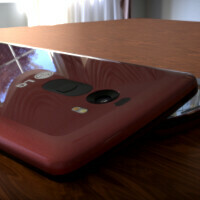 Would love it if the G4 came out like this as I was a fan of the G3 and still own one. yeah, it's a concept by me. There is hardly any chance LG will make it look like this.